OWN YOUR OWN PERSONAL SPA & RETREAT IN THE HEART OF SIMPSONVILLE / OUTDOOR LIVING BEYOND EXPECTIONAL: GATED COMMUNITY / IN-GROUND POOL & HOT TUB / OUTDOOR COVERED PATIO W/ KITCHEN & STACKED STONE FIREPLACE / FULLY FENCED BACKYARD / SCREENED PORCH W/ FIREPLACE / 5BR/5.5BA / KITCHEN W/ GRANITE COUNTER TOPS, STAINLESS STEEL APPLICANCES, DOUBLE OVEN, & CUSTOM CABINETRY / TWO-STORY FOYER / HARDWOODS THROUGHOUT MAIN LEVEL LIVING AREAS / OFFICE W/ BUILT-INS & EXPOSED BEAMS / TWO-STORY GREAT ROOM W/ BALCONY OVERLOOK, VAULTED CEILING, & BUILT-INS / MASTER ON MAIN / LARGE BONUS RROM W/ OFFICE W/ OFFICE NOOK / 3-CAR ATTACHED GARAGE Magnificent best describes this one of a kind masterpiece that showcases superior craftsmanship, an easy living floor plan, and attention to detail. The interior of the home is stunning, with extensive hardwoods, dramatic crown molding, and picture frame wainscoting. A two-story Foyer makes a powerful first impression with a lantern style chandelier, bull nose chair railing, and custom front door with arched topper and sidelights. Adjacent to the Foyer youll find French doors leading to a large office/music room with vaulted ceiling, which is enhanced by heavy exposed beams. An arched case opening leads into the formal Dining Room that showcases picture frame wainscoting, bull nose chair railing, and a detailing chandelier. The centrally located two-story Great Room is expansive! It showcases a gas log fireplace with tile surround, vaulted ceiling, a wall of windows that allow plenty of natural light to fill the space, and built-in shelving to display all your treasured dcor. The amazing Kitchen is sure to be a chefs paradise. Custom detailed cabinetry along with stainless steel appliances, pot filler, granite counter tops, tile backsplash, and more! Beyond the Kitchen you will be delighted to find a Breakfast area that features three large windows that overlook the amazing backyard with all its amenities... The main level of the home also includes a luxury Master Suite with vaulted ceiling, large picture window, and an incredible walk-in closet. The spa like Master Bath is highlighted by a dual vanity with granite counter tops, jetted tub, and separate shower with tile surround. The main level of the home also includes the second bedroom with pool area entrance, and its own ensuite bath. Three additional bedrooms, two of which feature private bath access can be found upstairs along with a large Bonus Room that features a Kitchenette and additional Office space. Exceptional outdoor living spaces! 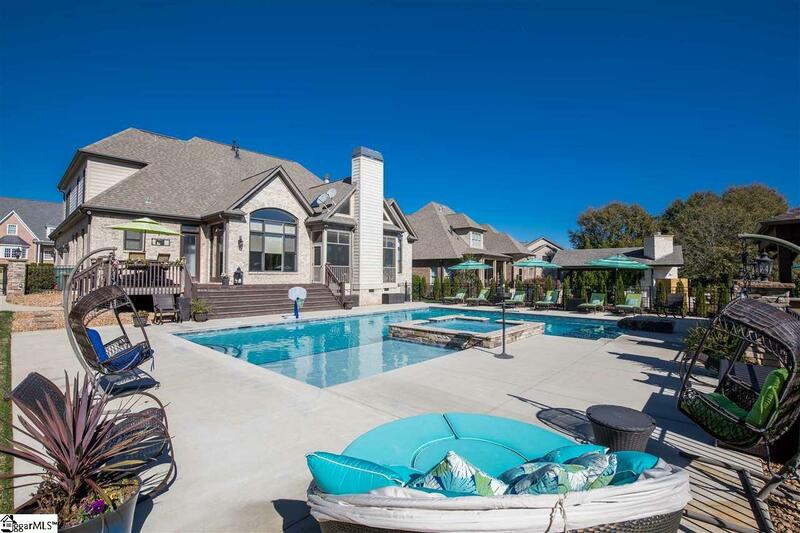 The in-ground pool, hot tub spa area, and outdoor Kitchen will definitely be a favorite spot for all your family and friends to gather whether in the warmth of the summer or just to relax and enjoy a cool Carolina evening. Other notable exterior features include a Screened Porch with stacked stone fireplace, Trex Deck overlooking the pool and backyard, and a three-car attached Garage. 14 Cobbler Lane is simply superb, come experience all that this home has to offer today! Please note: Lot line extends past the pool fencing.